These widely used, comprehensive assessment tools measure both environmental provisions and teacher-child interactions that affect the broad developmental needs of children, including cognitive, social-emotional, physical, and health and safety. 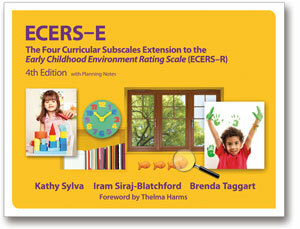 See below for our full list of ITERS, ECERS and SACERS products. 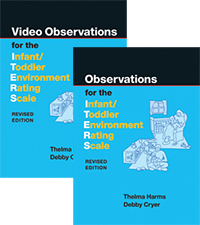 Measure the quality of your infant and toddler program with this easy-to-use evaluation instrument. The rating scale evaluates personal care routines, furnishings, language, fine- and gross-motor activities, creative activities, social development, and adult needs. Identifies areas where quality is already high as well as identifying where improvement is needed. Useful for new programs, staff training, and pre-accreditation evaluation. Spiral, 80 pgs. 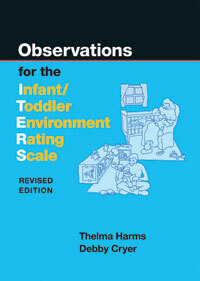 Spanish edition of the Infant/Toddler Environment Rating Scale, Revised Edition. 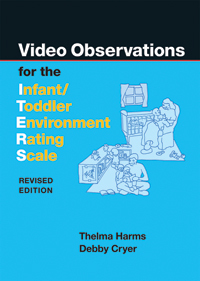 Measure the quality of your infant and toddler program with this easy-to-use evaluation instrument. The rating scale evaluates personal care routines, furnishings, language, fine- and gross-motor activities, creative activities, social development, and adult needs. Identifies areas where quality is already high as well as identifying where improvement is needed. Useful for new programs, staff training, and pre-accreditation evaluation. Learn how to use the ITERS-R. This training package includes an interactive DVD, 4-page instructor's guide, and 16-page participant workbook. DVD, 35 min. Learn how to use the ITERS-R. This DVD training package contains an interactive DVD and an instructor's guide, which explains how to present the various training activities and provides answers and explanations for questions that may arise. This 16 page guide includes training activities, which can be reproduced for use in the classroom for educational purposes only. Each participant will require a personal copy. 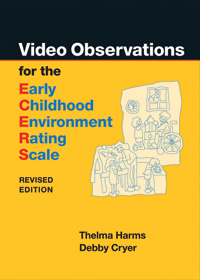 The long-anticipated new version of the internationally recognized Early Childhood Environment Rating Scale, ECERS-3, focuses on the full range of needs of preschool- and kindergarten-aged children. 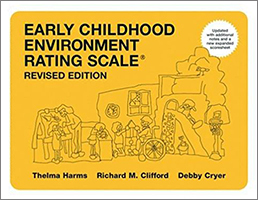 This widely used, comprehensive assessment tool measures both environmental provisions and teacher-child interactions that affect the broad developmental needs of young children, including cognitive, social-emotional, physical, and health and safety. 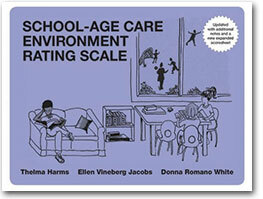 Assess the quality of your early childhood environment. 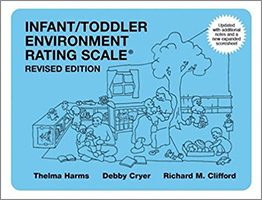 This widely used program quality assessment instrument includes 43 items that evaluate the use of space, materials, and experiences in order to enhance children's development, daily schedule, and supervision. Designed for preschool, kindergarten, and child care classrooms serving children 2 1/2 through 5 years of age. Use the ECERS-E alongside the ECERS-R to get a more complete picture of what a high-quality early childhood education program can look like. 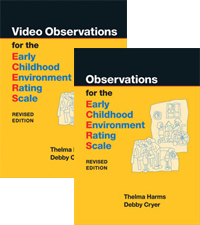 ECERS-E not only complements the ECERS-R but extends the scales to provide additional insights into important aspects of literacy, mathematics, science and environment, as well as practices related to issues of diversity. It can be used by program directors, teaching staff, agency staff, and in teacher training programs. 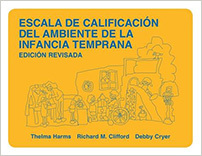 Spanish edition of Early Childhood Environment Rating Scale, Revised Edition. 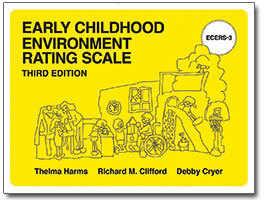 Assess the quality of your early childhood environment. 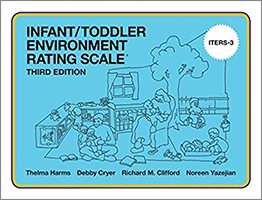 This widely used program quality assessment instrument includes 43 items that evaluate the use of space, materials, and experiences in order to enhance children's development, daily schedule, and supervision. Designed for preschool, kindergarten, and child care classrooms serving children 2 1/2 through 5 years of age. Learn how to use the ECERS-R. This training package includes an interactive DVD, 4-page instructor's guide, and 16-page participant workbook. DVD, 35 min. This DVD training package contains an interactive DVD and an instructor's guide, which explains how to present the various training activities and provides answers and explanations for questions that may arise. This 16-page guide includes training activites, which can be reproduced for use in the classroom for educational purposes only. Each participant will require a copy. This updated edition includes 47 items to evaluate the quality of your after-school program. Improved scoring and assessment in areas such as space and furnishings, health and safety, activities, program structure, staff development, and more.